If surveyed, most homeowners will most likely admit that a majority of their meals, whether taken alone or with family members, are usually consumed in their kitchen; whether seated at the kitchen table or a breakfast bar or standing at an island counter, the prospects of having their breakfast, lunch, and supper in this room every day will far outweigh the probability of using their dining room with any degree of regularity. Yet there is something special about enjoying a meal in the aura afforded by the dining room. Whether an intimate dinner for two, a family gathering to celebrate a birthday or anniversary, or an evening spent with friends, the ambience of these occasions can be augmented if they are held in the dining room rather than the kitchen. Of course, the duration of these occasions is usually considerably longer than the amount of time needed to consume a bowl of cereal and a piece of toast in the morning; and this means remaining seated, in a relaxed and comfortable fashion, for an extended period of time. There is certainly a wide range of options to consider when buying new high-end dining room chairs or furniture sets, with many important decisions also to be made. To help homeowners in their decision-making process, the Carrocel fine furniture showroom, located on Bridgeland Avenue near Yorkdale Mall in Toronto, offers a 20,000 square-foot showroom where buyers can browse and compare an exquisite selection of luxury dining chairs for sale from vintage to modern/contemporary styles as well as top brands of high-end dining room sets from leading furniture manufacturers. Enhance the comfort and the elegance of your at-home meals and entertaining with a new high-end dining room chair set or complete suite from Carrocel fine furniture, one of Toronto’s leading furniture stores. 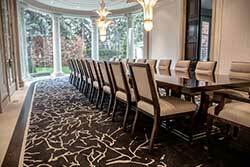 Call the experts at Carrocel fine furniture at 647-694-4683 today or Contact us to book a no-obligation consultation on the furniture style, construction, and design that will best suit your needs and your dining room. Really the design is amazing. One more thing is dining furniture colours and designs are perfectly matching to the interiors. Thank you for your interest in our beautiful unique furniture pieces. We welcome you to come and visit our Toronto showroom located right by Yorkdale Mall at 245 Bridgeland Avenue, North York. If you are unable to come and visit please take a look at our products online and give us a call or email.